Companions from Emmaus, and other guests, enjoy a Christmas meal with The Barrow Boys. Hull’s hottest new dining, drinking and dancing venue welcomed more than 40 guests from the city’s homeless community and served up a Christmas treat to remember. The Barrow Boys – known far and wide as Purveyors of Good Times – demonstrated their commitment to helping people through hard times by opening its doors for an afternoon of festive fun. 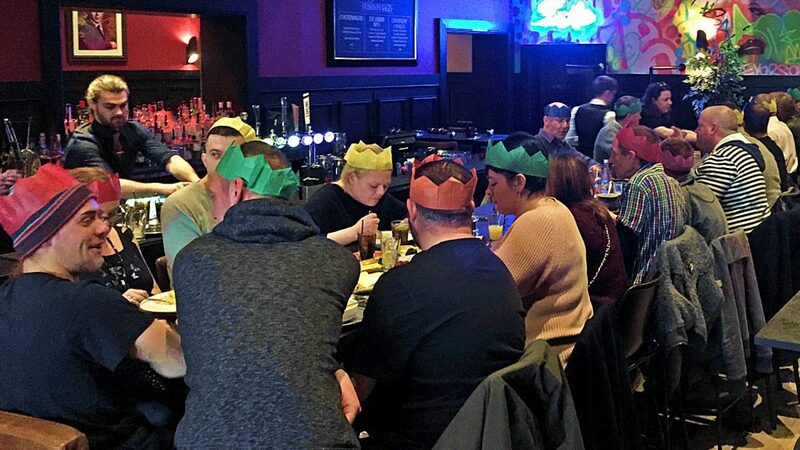 The bar joined forces with Emmaus Hull & East Riding to provide homeless people with a traditional Christmas lunch with all the trimmings in the plush surroundings of the bar in Humber Dock Street, Hull. And the event was also much more than a meal, with top entertainment delivering a live performance free of charge, and a winter warmer pack donated by the Tommy Coyle Foundation, which covered the costs of the food and non-alcoholic drinks and equipped guests with hats, scarves and gloves. Tommy Coyle, co-founder of The Barrow Boys and Managing Director of the Tommy Coyle Foundation, said: “Boxing has been good to me and the people of Hull have supported me not just in victory but in defeat as well and this is just one of the ways I like to try give something back to the city I am extremely proud to be from. Dan Poole, Director of Barrow Boys, provided the venue and the services of his chefs, bar staff and front-of-house team free of charge. He said: “We’re known for good times here at Barrow Boys, serving great food and drink and presenting top quality entertainment, and we wanted to share that experience with people who are less fortunate. Emmaus took the opportunity to promote the homeless app which it launched recently and which enables users to send instant information about rough sleepers. Kelly Finnis, Director of Emmaus Hull & East Riding, said: “Emmaus are delighted to be supporting this special Christmas initiative funded by The Barrow Boys and the Tommy Coyle Foundation. “This isn’t the first time we have helped with this annual event which supports those affected by homeless. I’ve always been blown away by Tommy’s generosity, kindness, and above all desire to give back to those less fortunate. This event offers plenty of festive cheer and will be a lasting memory for all those who attended. “Tommy works hard supporting social development in our city in a variety of ways. We want people to be aware that homeless charities in Hull have always been supported by the Coyle family at Christmas time. Certainly, during my time for over a decade, the family have always shown their generosity for those most disadvantaged. Be the first to comment on "“Purveyors of Good Times” help homeless people in hard times"